Former FBI director James Comey said Thursday he felt that President Trump had directed him to drop an investigation into former national security adviser Michael Flynn. But Comey declined to say whether he thought Trump had obstructed justice. He said such a determination was up to special counsel Robert Mueller. Senator Jim Risch, a member of the Senate Intelligence Committee, in questioning Comey Thursday, noted that Trump had only said he “hoped” that Comey would drop the investigation. “He said, ‘I hope,’” Risch said. 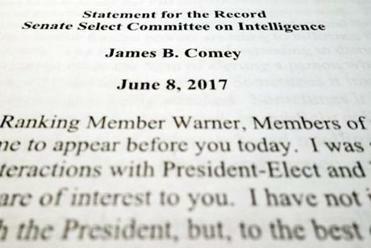 Read the full text of former FBI director James Comey’s testimony, slated to be delivered tomorrow. Read: Will Comey address these essential questions? But Comey said he understood that Trump was directing him to drop it. “I took it as a direction . . . I took it as, ‘This is what he wants me to do,’” Comey said. “That’s a conclusion I’m sure the special counsel will work towards,” he said. Flynn was in “legal jeopardy” at the time as the subject of an FBI investigation, he said. Comey also testified that he was confused and concerned about the “shifting explanations” that the Trump administration gave for his firing two months later. Comey said Trump had told him repeatedly he was doing a good job and he was puzzled by Trump administration comments that questioned his leadership and, later, when he learned of statements by Trump that indicated he had fired Comey because of the FBI’s investigation of Russian contacts with the Trump campaign. “The administration then chose to defame me and, more importantly, the FBI by saying the organization was in disarray, that it was poorly led, that the workforce had lost confidence in its leaders. Those are lies plain and simple,” he said. “The FBI is honest, the FBI is strong, and the FBI is and always will be independent,” he said. Comey gave dramatic testimony on the Feb. 14 conversation and other contacts he had with Trump that he says made him deeply uneasy and concerned about the blurring of boundaries between the White House and a law enforcement agency that prides itself on independence. Trump has insinuated that he may have tapes of some of his conversations with Comey. “Lordy, I hope there are tapes,” Comey told the committee Thursday. “All I can do is hope. The president surely knows whether he taped me. . . . Release all the tapes, I’m good with it,” Comey also said. Comey arrived in a Senate hearing room where he began testifying around 10 a.m. in a hearing that lasted nearly three hours. The testimony, Comey’s first public statements since his May 9 dismissal, brought hours of uncomfortable attention to an administration shadowed for months by an investigation into ties between the Trump campaign and Russia. Comey’s detailed and vivid recollections of his conversations with Trump were laid out in seven pages of prepared testimony released the day before his appearance before the committee. At the outset of the hearing, Comey said he wouldn’t repeat what he said in his written statement, though he would answer questions. The statement said Trump, in addition to asking Comey to drop the Flynn investigation, had also repeatedly pressed Comey for his ‘‘loyalty’’ and pushed him to ‘‘lift the cloud’’ by declaring publicly the president was not the target of the probe into his campaign’s Russia ties. The remarks paint a picture of an FBI director so disconcerted by his interactions with the president that he began keeping written memos of their private discussions, including one he hastened to type out in an FBI vehicle immediately after a Trump Tower meeting. The statement said he believed the president was trying to create a ‘‘patronage relationship’’ with him and described in detail a meeting in which Trump urged him not to investigate contacts by Flynn with Russian officials. But the ex-FBI director also said that, as of the time he was fired in May, Trump was not a target of the federal counterintelligence investigation into possible campaign collusion with Russia. Comey says he did offer the president that ‘‘assurance,’’ but resisted Trump’s appeals to make that information public.